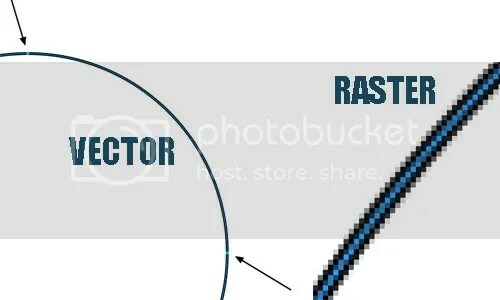 Raster and Vector are common terms in found in Graphic Design when referring to images – but what do they mean and how do they differ? This topic often confuses new designers and basic image users. The simple explanation is that a Raster image is made up of bitmapped pixels, while a Vector image is made up of paths. Let’s take a closer look at each. A Raster image, often referred to as a bitmap image, is composed by a series of tiny squares (pixels) formatted on a grid. Digital cameras, scanners, printers, computer monitors and televisions utilize the same system. When these squares are looked at together as a whole piece, they form a complete image. The quality of the Raster image is defined by the size of the total grid versus the number of squares used within that size. This is called resolution. The higher the resolution, the clearer the image. The lower the resolution and the image can be blurry (or pixelated). Resolution is often referred to as Dots Per Inch (DPI). Common resolutions are 72 dpi, 300 dpi, 600 dpi, 1200 dpi, etc. One caveat of Raster images is that a small Raster cannot easily be made larger without losing quality (called interpolation), while a large Raster can be made smaller and retain quality. Programs like Photoshop, and other paint-oriented programs, are Raster-based. Raster images have the ability to showcase millions of colors and subtle variations, and thus are perfect for photographers and full color design work. Raster images can be very large in file size, dependent on the resolution. Common file extensions using Raster images are .bmp, .jpg, .pict, and .tif. The key tip to remember with Raster images is higher quality and bigger is better. A Vector image is defined by a mathematical equation creating a shape (x and y coordinates) – called a path. These paths are connected by lines of various shapes and sizes, and then filled with a solid or gradient color. The more complex the path, the more detailed the shape, and thus the image. Vector images are natively transparent, and can be easily manipulated, updated or changed. Vector images have the ability to be scaled – up and down – infinitely. The same file can be 1/4 inch wide or 40 feet long – and it will hold all of the properties showing clean and precise edges. Fonts are a good example of a Vector. Programs such as Adobe Illustrator, Freehand, Corel Draw, and yes, even certain modes in Photoshop, are Vector-based programs. One of the key disadvantages of Vector images is that it is not universally exchangeable in all software packages. The most common extensions for Vectors are .ai, .eps, and .FHx, along with certain .PSD files. PDF files have the ability to hold and retain Vectors, as well as Rasters. Vectors are generally smaller in file size than Raster images. The two formats can reside together in documents. Vector images can also be easily converted to Raster Images. It’s not so easily to convert a Raster image to a Vector without a lot of time and work in most cases, especially if the image is complex. Programs such as Adobe InDesign and QuarkXPress are made to work with both formats seamlessly. What is the best use of each? When designing for an outlet that will be primarily for viewing (such as on monitors or television) Rasters are a prime choice, achieving many desired effects and colors. The average resolution for a graphic on a website is 72 dpi or 100 dpi. If the final output is photographic in nature, then Raster is also the preferred format. If the final product is to be printed, made into a sign, used for embroidery, etching, etc., then a Vector image is the preferred format, thus holding clean and clear scaling at any size. Logo design is a prime example of Vector use – as the image will be used in a number of ways – such as printed on letterhead and in a brochure, viewed on a website, cut into a sign, and embroidered into company shirts. Logos need to be flexible and fit each desired media. Once designers have experience with both types of graphic formats, then they will easily be able to choose what works best for each use and purpose.